You may be wondering, why a definition about the Product manager is required? As everyone is aware of the same. It looks like I am teasing you with this definition. Trust me the intention is not to tease you but to make you understand that, in what way a “Product Manager” (PM) comes into the frame of Agile development is the most perplexing features while looking at a Scrum method in Agile development. From the textbook standpoint, viewing the whole thing using that lens, it is significant to realize that Scrum was planned originally as a set of advancement practices. The root cause for the confusion arises mainly because in Scrum the “Product Owner” (PO) plays a major role and he/she is envisioned as the “one point contact” with the external world. 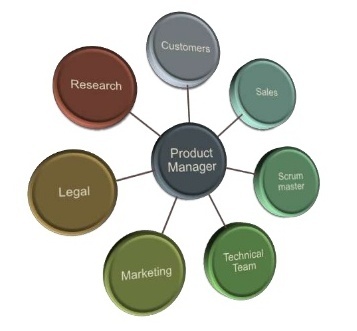 This role of a PO blends completely with the Product Manager’s role, without evaluating that role properly, understanding the requirements to be handled, and what are the rest of the responsibilities are required must be involved in the market aren’t considered by Scrum as an advancement practice. A very clear difference between the Product Owner and the Product Manager mentioned below will now help us to walk our journey of elaborating the Product Manager’s key role in establishing an effective sprint planning meeting. Product Owner is the person required to be available always during the product development. The ownership of the Product is explained as the Product Owner’s association with the developers and their entire team. Product Manager is the person required to be contacting the internal and the external world, i.e. the market, the buyers, the users, and the decision-makers who are there in the outside world of the market. The other team stakeholders, the top management within the organization comprises the internal world. Product Management is well-defined by the role’s association to the market. Upon having an insight about the difference, let us now talk about the Product Manager’s role in agile organization. Product manager works together with the scrum team and carries out the following activities. The Product manager plans and deals with the sprint cost estimate. Also, plans and deals with the stakeholders cost estimate. The Product manager actively does the goal setting. Product vision is generated and preserved. The Product manager needs to clearly explain the value of the business to the entire scrum team and enable all to work towards one goal of releasing the right product. PMs holds the responsibility of his/her team’s delivery irrespective of the processes followed by the team. The product manager is responsible for the delivery of the product. He/she authenticates the project need, generates the release strategy and make sure to sustain it throughout the development life cycle. The Product manager must be aware of the when and why to plan for a release. He must decide about handling features. He must also handle all the dependencies to release the product as per the plan at various stages. The thirst for any organization is want of more creativity. Though they wish, it is difficult to handle and put in sequence. But the prime duty of the Product managers is to be innovative. He must gather, execute, and endorse the creativity into the features. The product manager must understand the requirements flow and rank them based on the need. He/she should prepare and supply product backlog in a continuous fashion preventing the disconnect in the flow of the sprint planning. They need to check and submit reports about the stages of the progress. Acts as a negotiator between the technical guys, the business, and the management. Gives an insight to the scrum team about the market trends. Links all the stakeholders within the organization with the customer to deliver an effective product. The job of a product manager does not end with the release of the product but it continues to promote the product in the market. He is the acting CEO of the organization. He conducts market research and plans accordingly to promote the product. He works closely with the finance team in budgeting and with the sales and marketing team to roll out the product in the market. The product manager is ultimately responsible for accomplishing the growth of the organization by calculating the revenue generated, ROI, profit and loss estimation, market share across all the networks inside and outside the company. The product manager conducts and executes promotional events. Brilliant Product Managers builds a team which is dedicated, attentive and zealous. PM does a great planning throughout the scrum development cycle. Thus, able to deliver even the most peculiar need of the customer. We have seen enough answers for this question in our previous article, just as a brush-up, A sprint is basically a brief, timeboxed single development cycle. During product management, a sprint should be as effective as accomplishing the work and made available for evaluation. The primary goal of the Sprint is setting an objective for the Sprint, and it can be met through the execution of Product Backlog. This is implemented by working together upon identifying the functionality and features that can be included or enhanced to delight the end users. Effective Sprint commences with the Sprint Planning Meeting.